In a certain sense, I was spot on, because the THNDR mod itself is a quality machine – not the most accurate, most delicate or most beautiful. 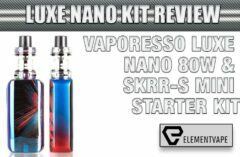 But it’s a great combination of those things, in a unique package that stands out on shelves, and looks good with any tank or atomizer you attach to it. The tank that comes in the box? Well, that’s a different story. Let’s first take a look at the (abbreviated) official description and specs for the CKS THNDR kit. 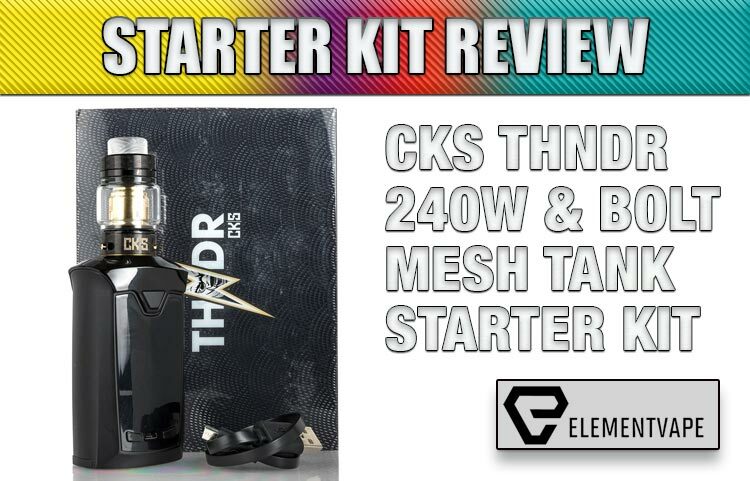 According to Element Vape, the CKS THNDR Kit combines the proprietary VO Chipset, versatile battery options, and a wide selection of mesh coils for any preferred vaping outputs. 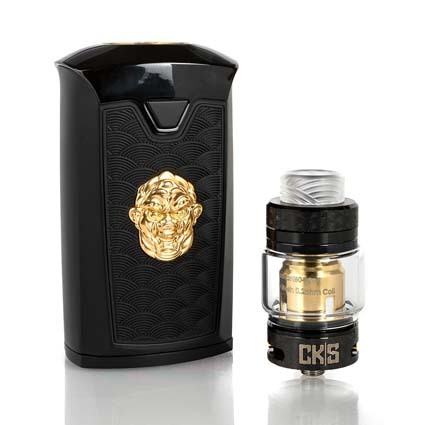 The CKS THNDR box mod is formed from durable zinc alloy, and is resistant to mild and moderate drops and slips. There’s also a 1.3″ TFT Color Display Screen, two adjustment buttons, and a Micro-USB port located at the base of the mod. On the reverse is a visually striking 3-D FUJIN god, decorating the clean backface with a luxurious raised emblem bathed in gold, right below a secondfiring button. The included CKS BOLT Mesh Sub-ohm tank is built with durable stainless steel, featuring a sliding top fill system, knurled dual slotted bottom adjustable airflow control ring, and great variety of mesh coils and a new temperature control coil option. The CKS THNDR makes a commanding first impression, with a large frame, capable of 21700, 20700 or 18650 cells (when using the included adapters). How large? Let’s just say it takes up a good portion of my palm, with the top and bottom sticking out. But the beauty of the design is that it never once feels unwieldy or obtrusive. Instead, the gently curved sides, smooth angles and intelligent layout make the THNDR feel natural in the hand, no matter how you operate it. Speaking of which, the most interesting design element (aside from the weird monster/alien/tribal god emblem on the back) is the placement of two different fire keys on both sides of the mod. They’re in identical positions, so it’s really just an ergonomic preference for thumb or finger firing. But there’s something so simple about the idea that I wonder why more companies aren’t offering this as an option. The THNDR’s display is interesting. On one hand, the TFT display is bright, attractive and easily navigable, even with that tribal beast showing its head above the wattage readout. On the other hand, the font choice is questionable, making certain numbers look like others, and forcing me to do a double take before realizing how the mod was set. Hardly a big deal, but I wouldn’t be opposed to a firmware upgrade that gives me a few more layout/font options. The VO chipset is one we’ve reviewed more than once, and this upgraded version brings forth the same ease-of-use, with linear menus and a general sense of stability most systems lack. That said, if there was ever a device that screamed for an enter/input selection button, it’s this one. This chipset would only benefit from more straightforward navigation, and the device certainly has the real estate to handle it. I’m strongly considered renaming this section “Standing Out (When It Shouldn’t)” because it has become a repository for sub-ohm tank horror stories. Unfortunately the same is true here, thanks to a complete fail from the included BOLT sub-ohm tank. Now, let’s be clear – I don’t think this is a bad tank series. Instead, I just think my situation was a fluke. But that doesn’t change the fact that I couldn’t even review the tank, because it did nothing but leak. Literal puddles of juice were on my desk within minutes of priming and filling the BOLT to a reasonable level. And it happened multiple times. Yes, I closed the airflow, checked the o-rings, ensured the sliding top-fill was shut, swapped the coils, and then did it all again a few minutes later. But an entire roll of paper towels didn’t change the outcome – my BOLT was defective. It’s a shame, because I really wanted to give this one a whirl. 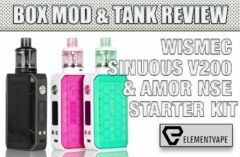 Not only is the tank a great match for the device, with a large size, ample 6mL capacity and overall look. But I can’t test a tank that never lets me get out of the gate. If we get another, I’ll certainly update this review to reflect it. Since the tank was a non-starter, I opted for my recently acquired HorizonTech Falcon King (review coming in the next few weeks) and let it rip. And this is when I really wanted the BOLT tank to be there, because if the THNDR performed this well with a different tank, imagine how well it might have worked with its companion atomizer attached. A device of this size screams “brute force” but in reality, the ugly god-adorned THNDR is also a precise and delicate operator, with the VO chipset offering comprehensive temperature control up to 600-degrees Fahrenheit. 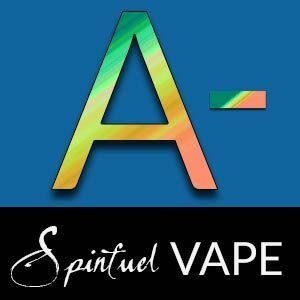 There’s no stuttering or missteps here, just accurate, stable TC vaping that doesn’t flutter, even under heavy use and tons of adjustments. 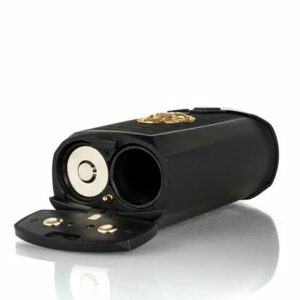 But, because we’re a “brute force” kind of team, we spent most of our testing in wattage mode, and enjoyed just how smooth the THNDR was, all the way to its 240-watt limit… not that any of us vape anywhere near that number. 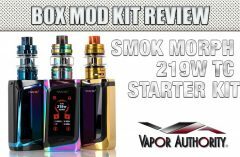 But with a pair of 21700s installed, this is about as powerful as a dual-cell mod gets in 2019, with battery life that doesn’t disappoint, we might add. In addition to the Falcon King, I tried a slew of other sub-ohm tanks, RDAs and even a few MTL rebuildables, just to see if the THNDR could perform at low wattages, too. Sure enough, it handled everything I wanted it to do, and more. The dual-button firing system was cool, and worked well. Though I think I would have considered making one of the buttons a trigger on the narrow side of the device, rather than placing a pair of identical buttons as a mirror image on the broad sides of the mod. It’s hardly a big deal, but that would be a better accommodation for differing vaper preferences. Also, while the god logo badge isn’t nearly as intrusive as what Snow Wolf did a while back with some of its newer devices, it still rubs annoyingly when holding the mod, since the screen is on the other side. Because I was so impressed with the THNDR and CKS’s presentation and attention to detail, I’m going to chalk up the tank performance to a fluke, and not factor it into the test. I hope to get the chance to try it again in a future review. That said, if you’re looking for long-lasting power, surprising temp control intricacy, and a commanding feel in the hands, the CKS should be on your short list for 2019. This might not be a perfect device, especially if size and subtlety are a concern. But the THNDR’s VO chipset and strong performance make a sizable impression from the moment you open the box.